Q One of our rats, Phoebe, was bred on 3-10-08 between 10–11 P.M. and the following morning between 6–7 A.M. As of 7 A.M. this morning 4-3-08 (day 23, 24), she has not given birth. She’s nice and fat and looks like she’s ready to explode! Yesterday morning, we noticed a bulge/lump (the size of a baby) down between her legs. Could it be a baby lodged in the birthing canal? I went to check on her this morning—I went to gently pick her up (to look at the bulge), she squeaked and ran away, leaving a spot of blood behind. This is her second litter, the first one was on 5-9-07. She was born on 11-9-06. She’s eating and drinking normally. Should we be worried? And if so, can you recommend a vet to help us? 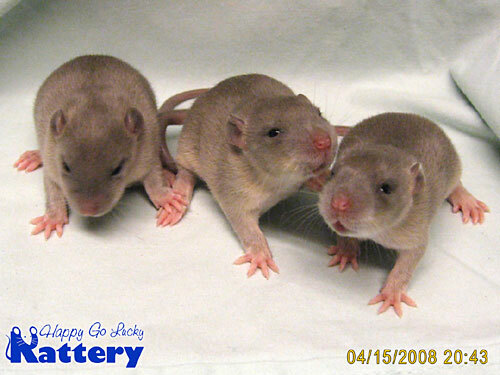 Can a rat still care for a litter after a C-section, or should we start to look for someone who has a nursing mother? We were expecting babies Tuesday night (day 21, 22), then thought it would be last night, now we’re getting a little worried. Later on 4-3-08: Phoebe is having her babies as we speak. She started all on her own (day 23, 24). She gave birth to 4 babies, one of which didn’t make it through the night. She was still very swollen the next morning. She and her babies didn’t look so good. It seemed that she still had a baby or two to deliver, and we took her to the vet. She received a shot of Oxytocin to help pass any remaining babies. It worked, Saturday morning came, she lost 18 grams overnight, the swelling went down, and she looked like her normal happy self again. The 3 remaining babies look better as well. She didn’t deliver any more live babies. The Russian Blue Agouti babies in question at 12 days old. Photo from Ken and Connie Van Doren, Whittier, CA. 4-15-08: These babies started to open their eyes yesterday (day 11) and they’re all open this morning. Could their eyes be opening early because they were born late? Or could it be that with only 3 of them, they’re maturing faster? They are very chubby now and getting lots to eat. A (I phoned them with advice on the pregnancy delay and a vet name.) It depends on where exactly the bulge is that you refer to. If you see a “lump” in the opening, it could be the top of the head of the baby that got turned as it was coming out. If this is the case, you can gently manipulate the area to get the nose out (wetting with water if necessary) and then gently easing the baby out. I’ve always found these to be dead but there may be live babies delivered after you remove the blocked one. She should then be able to get any remaining babies out on her own. Answer by Carmen Jane Booth, D.V.M., Ph.D.
A The eyelids are open in utero and close during the last part of gestation (day 17–18 on rats; day 14–16 on mice). The eyes finish developing after birth and the eyelids open later. There is a 2–3 day range for most strains. Day 11 is early and it is absolutely possible that she gave birth late and this would account for the early opening. The age range for opening of the eyes in mice is 10–14 days. The earliest reference I could find for rats was day 12–14 to open the eyes. I would assume that the 11 days in these rats could be due to delayed gestation or within the range of normal.